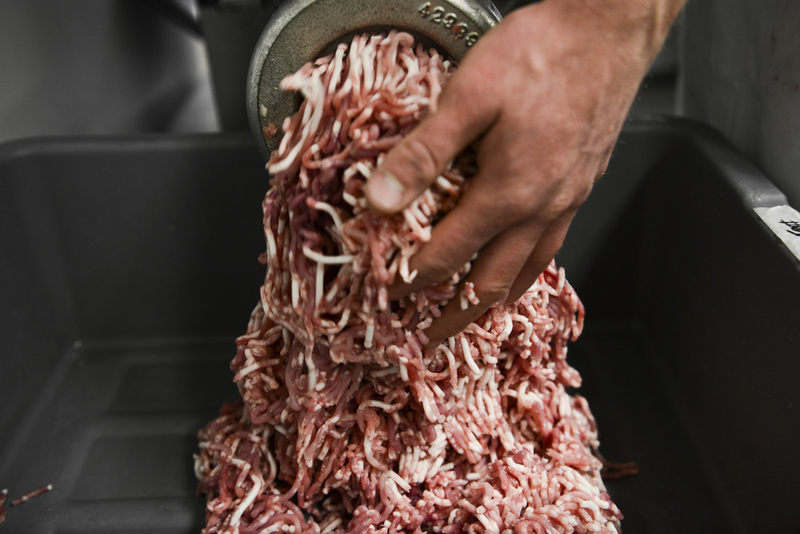 Made fresh from the whole animals we receive each week, our sausages are all made fresh in our shop. We offer over 50 different kinds of sausage, but the list below may not reflect what we have in stock each day. If you don't see the one you're looking for in the shop, let us know and we can try to make it in the future! A German classic: pork, cream, eggs, caraway–put it on a bun with a bunch of mustard and wash it down with a beer. Sweet and sour like the name suggests. Pork and beef with sweated onions, fresh thyme and a sweet balsamic reduction. Simple and delicious–pork, red pepper flake, lemon zest, white wine, grated parmesan, and fresh parsley. Perfect out of the casing and in your pasta. Classic Tuscan-style link–loads of fresh garlic with toasted whole fennel and ground fennel seed. Light and sweet, just like how Mike White takes his coffee. A traditional mild Italian sausage made with pork, paprika, fresh rosemary, garlic, and fennel. Pork, cayenne, red pepper flake, red wine, garlic and fennel–it's the reason your boyfriend thinks your sauce is better than his mother's. The name says it all (no, seriously). One of our best-selling sausages. Our Sweet Italian sausage, but with white wine and lemon zest for good time summer vibes. A classic French sausage with pork, shallot-infused cream, white and black pepper, and enough fresh thyme to make a few interns quit. The taco chorizo of your dreams. Pork, guajillo and pasilla chilis, cumin, and red wine vinegar. Jalapeno, poblano and serrano peppers are all deseeded and finely chopped before being mixed with pork, toasted cumin, Mexican oregano and cilantro. It takes forever to make it, but we do it because we like you and you like this. A Mexican-style green chorizo named after the city this recipe comes from. Lean beef, pork and pork jowl, spinach, toasted pumpkin seeds, deseeded serrano peppers, A staff favorite that's perfect in a breakfast burrito. Pork, sage, brown sugar and lots of black pepper. Buy it in loose packs or in shorty-links. Grand slam! Just like our breakfast sausage but without all the sage hootenanny. A traditional South African grilling sausage made with beef and pork, white pepper, toasted coriander, and cider vinegar. Best enjoyed on a bun with a beer. A sweet and sour fermented Chinese sausage, lightly smoked and perfect in fried rice. Simple and delicious–chicken, garlic, thyme, cilantro, parsley, rosemary, and white wine. Chicken, parsley, thyme, and a whole lot of roasted and fresh garlic. Just don't eat it before Jenny's coed party later tonight. We took all day making this stupid thing so that you don't have to. Chicken, red wine and onion reduction, pretension, and fresh thyme. A classic Italian poached sausage made with pork, pork skin and warm spices, traditionally served over lentils on New Year’s Day. A British poached sausage made with beef suet, rolled oats, leeks, milk and black pepper. Tell your dad to put that Jimmy Dean log back in the basement freezer and stuff this in your turkey instead. A fermented and smoked beef and pork sausage, put it on your charcuterie plate with some good cheddar cheese and sweet mustard. Classic French-Louisiana smoked sausage made with onions, garlic and creole spices. Perfectly spicy, eat it on a bun or put it in your gumbo. Made with beef and pork and stuffed in a lamb casing. Best you’ve ever had, we’ve got an award to prove it. A traditional Polish sausage, smoky and slightly fermented. Maddy says go get a pilsner to wash it down. Chicken, sage, salt and pepper and house-made carrot celery and onion jus. A Moroccan classic made with lamb, paprika, cayenne, cumin, garlic, olive oil and red wine vinegar. Simple and fresh with lemon zest, garlic, and lots of fresh rosemary. Chicken, thyme, tarragon, roasted shitakes, creminis and a porcini broth. Beef and lamb, curry, garlic and ginger. Lamb mixed with Indian Masala spices, ginger, garlic and cilantro. Toasted Szechuan peppercorns, black vinegar, and fennel frond. Lamb with lemon zest, fresh parsley and capers. Duh. A bacon cheeseburger in tube form. Beef, pork, bacon bits, and cheddar cheese. You’ll love and hate us in equal measure. Sweet and smoky--pork and bacon, scallions, soy sauce, brown sugar and red pepper flakes. Bold flavors. Everywhere. Like the Vietnamese sandwich! Pork, house-pickled carrots and jalapenos, soy and hoisin sauces, Sriracha, and lots of fresh cilantro. The classic. The ultimate. Pork, pepperjack cheddar cheese, roasted jalapenos and Texas Pete hot sauce. YOU’RE WELCOME. One of our spiciest sausages, made with pork and seed-in Serrano peppers, mango powder and habanero powder. Just like the soup except you won’t get bored with it after you break through that top layer of cheese. Made with beef and pork, caramelized onions, thyme, beef stock and Swiss cheese. Just like the loaded up baked potatoes you always get from the Wendy’s late-night drive-through (we see you). Potatoes, bacon, sour cream, cheddar cheese, chives, pork. There’s no bacon in this sausage, this sausage is bacon if bacon was a sausage. Follow? 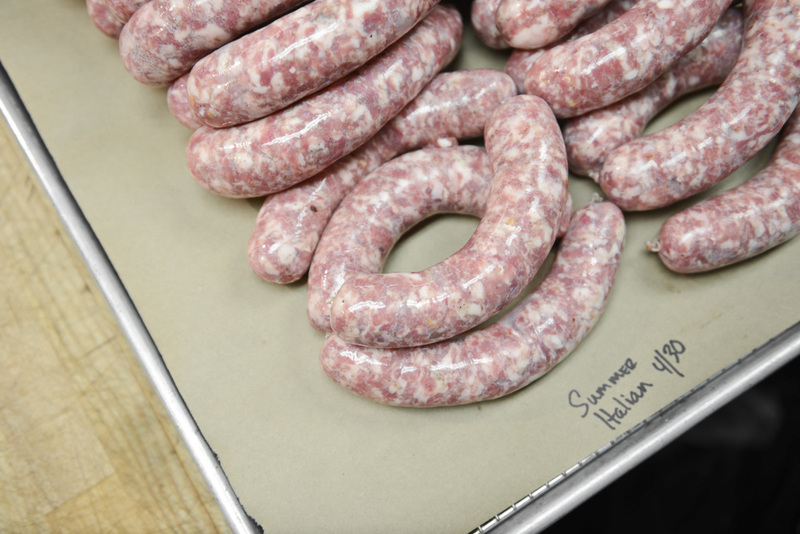 The pork in this sausage is cured like our bacon, stuffed like a sausage and smoked. It will blow your mind. A spicy smoked sausage made with seed-in serranos, cheddar, elegance and mustard. Eat it in a bun, with more mustard. Do it. An Austrian street-food staple, made with beef, pork, bacon. We smoke it and add cubes of Swiss cheese. Eat it drunk or sober, or drunk. Like your mom used to make on special occasions, but instead of stuffing the cheese and ham into that tiny chicken-pocket we went ahead and shoved it all into a casing. Chicken, ham, swiss cheese. Your favorite bar food without the wet-naps. Chicken, Frank’s hot sauce, blue cheese and a hint of celery seed. A pot of gumbo in a sausage casing—chicken, peppers, garlic, Creole spices and hot sauce, put it in your dirty rice. Does this power trio really need further explanation? Chicken, tomato sauce, breadcrumbs, basil, oregano, mozzarella cheese--fugheddaboutit. Chicken mixed with our house-made Carolina-style BBQ sauce. A Los Angeles style chorizo inspired by the taco haunts of your west coast youth. Slightly spicier, crumblier and more acidic than our Mexican style Chorizo, and made with beef and pork. Fresh jalapenos and ginger mixed with their powdered counterparts, lime-zest and pork. Pork, red onions, lime juice and zest, dark chili powder and fresh oregano. We're saving you a trip out to Flatbush. Chicken with Jamaican jerk spices and fresh peppers. An upstate New York take on the hot dog. Plump, juicy and lightly spicy, they're great for the grill. Serve with mustard. Lamb and beef sausage with the flavors of the best street gyro on the best corner on the best day. Eat on its own or slather with tzatziki. 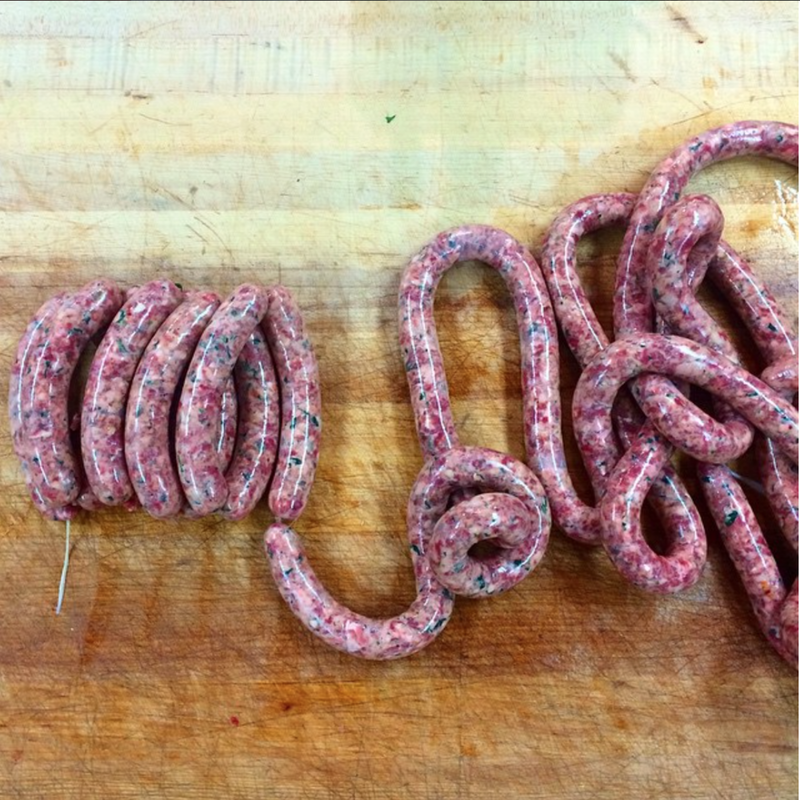 Our Thai Pork Roll recipe, adapted to a sausage. Fresh ginger and lemongrass, cilantro root, palm sugar and a splash of fish sauce. Everyone's favorite hot dog, stuffed with cheese.